The total crypto market cap increased by $5.3 billion to $177 billion since April 12. The op ten currencies are all in green for the 24-hour period with Binance Coin (BNB) leading the pack with 4.4 percent gains. At the time of writing bitcoin (BTC) is trading at $5,226 on the Bitfinex daily chart, while ether (ETH) stands at $166.8 and Ripple’s XRP dropped to $0.324. Bitcoin started the new week with a drop to $5,040 on the Bitfinex daily chart on April 15. The 2.9 percent drop put the BTC/USD pair under serious pressure and dangerously close to the important level of $5,000. A breach below that mark would mean bulls had lost their momentum. 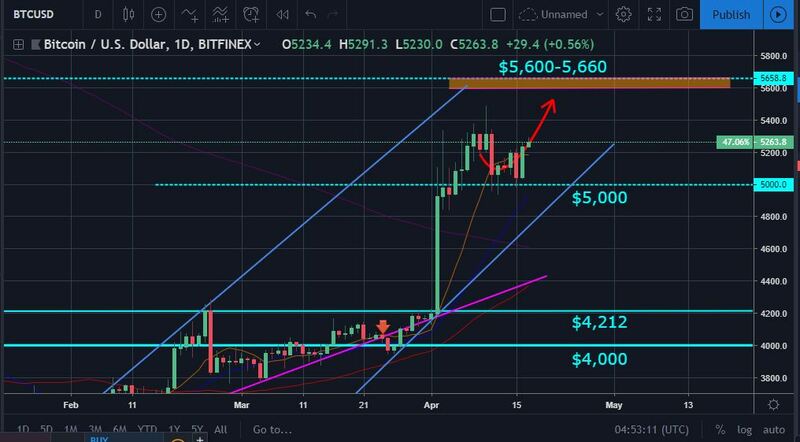 On April 16, the most popular cryptocurrency moved up to $5,240 and is back on track chasing the $5,600 to $5,660 levels. The coin successfully rebounded from price marks near $5,000 as predicted on the previous report from April 12. At the same time, the Ethereum token lost 3.4 percent of its value during the previous week and entered Monday in a bad position. It formed a red candle, which pushed the price down to $160 or 5.3 percent lower. 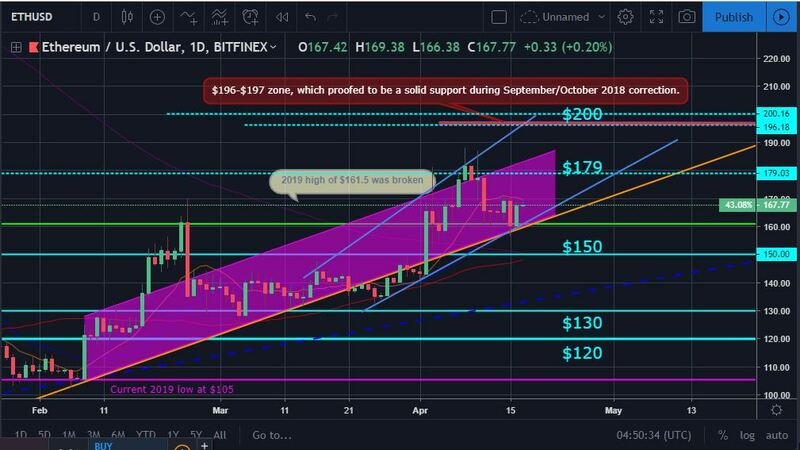 The ETH/USD pair found its short term support at $160, however, and managed to climb back up to $167 on April 16 after gaining 4.3 percent during the trading session. The move is directly related to the recent Twitter conflict between Binance founder and CEO Changpeng Zhao (CZ) and Bitcoin SV creator Craig S. Wright, who continues to claim that he is the legendary creator of Bitcoin – Satoshi Nakamoto. Unable to prove so, Wright continuously attacked and threatened social media platform users, which brought the attention of CZ. On the same day, Erik Voorhees, CEO of ShapeShift exchange announced that his company would follow Binance and remove the Bitcoin Cash fork, while OKEx decided to continue trading BCHSV. Bitcoin SV lost 26 percent of its value in the 24h period after the announcement and opened trading on April 16 at $54. In the meantime, the crypto derivative platform BitMEX is looking to introduce new types of services for its customers. Arthur Hayes, founder of the exchange and former Citigroup bank trader, shared his thoughts in an interview with Venture Coinist on April 12. According to Hayes, BTC-backed financial products like options and short term bonds will be a good addition to the current portfolio and his team will be actively working on that in the next 12 to 18 months. The social trading platform eToro officially launched its regulated cryptocurrency exchange eToroX on April 16. The Israeli-based company will offer support for six cryptocurrencies including bitcoin (BTC), ether (ETH), XRP, litecoin (LTC), bitcoin cash (BCH) and dash (DASH). Users will be able to trade them against eight fiat-based stablecoins. On March 3, 2019, the company expanded its operations to the United States and opened cryptocurrency trading services in 31 states via their official platform.